The problem often isn’t getting a Quaker parrot to talk -- it is getting him to stop. 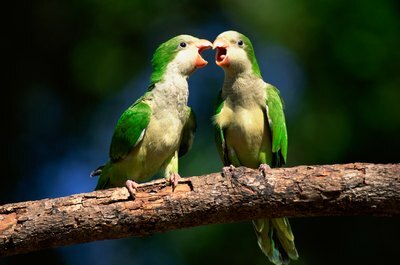 Quaker parrots imitate almost everything they hear and can link sounds to meaning. Some individuals are slower than others, but chances are your parrot will be talking his head off pretty quickly. Position his cage in the busiest room in your home, remembering to warn visitors not to say things in front of the parrot that they do not want repeated. Quaker parrots are extremely sociable and your birdie needs to feel like he's part of the family, with lots of companionship. If he's a shy rescue, place him in a room that gets some activity, but not a very noisy one for the first week or so. Include your bird in general household chat, addressing him in a completely normal voice. He is not a baby and just saying “Who’s a pretty parrot?” now and again in a squeaky voice probably won’t encourage him to talk. Parrots like to feel included. Select a few phrases that you would like your pet to learn and that could have some meaning in his world. Quaker parrots communicate with sound and those sounds have meaning to them. Parrots don’t really mindlessly “parrot” at all. Obvious choices are “hi,” the names of other members of your family and pets, and a name for his favorite food. Repeat these phrases in context as often as possible. For example, say “hi” or “hello” every time you enter the room and when somebody else does. Provide a small treat and praise when he says the word or phrase you are teaching. For example, give him a small piece of his favorite fruit or a sunflower seed when he says “hi” back to you, at least the first few times. Repeat the words he is saying immediately after he says them, especially if he is mumbling. This may help him to speak a new phrase clearly. Clicker training works as well on parrots as it does on dogs, possibly more so. Incorporating clicking with the treating might speed up the training process. Start talking to your parrot as soon as you bring him home. A very young parrot might not talk for a while and a nervous rescue might need time to settle in, but just hearing the sound of human voices should help him to talk later. It also makes him feel more comfortable. Avoid teaching your parrot to say any vulgarities or indeed anything that would offend the most easily offended person that you know. Although not as long-lived as their larger relatives, Quaker parrots can live for 30 years or more. There is a possibility he will need a new home at some point and it is not easy to find homes for birds who yell obscenities. As a rule of thumb, never say anything in front of your parrot that you do not want him to repeat and be aware of what is on the radio and television when he’s in the room. Quaker Information Center: How well do Quakers Talk? What Types of Food Can You Give to a Quaker Parakeet? What Are the Causes of Diarrhea in Parrots?